Akshara, the indestructible one that in plurality are consonance and vowels, is manifested in multiples by Shiva and Shakti, Purusha and Prakriti respectively. Shakti is the embodiment of energy and also the cause of all beings. 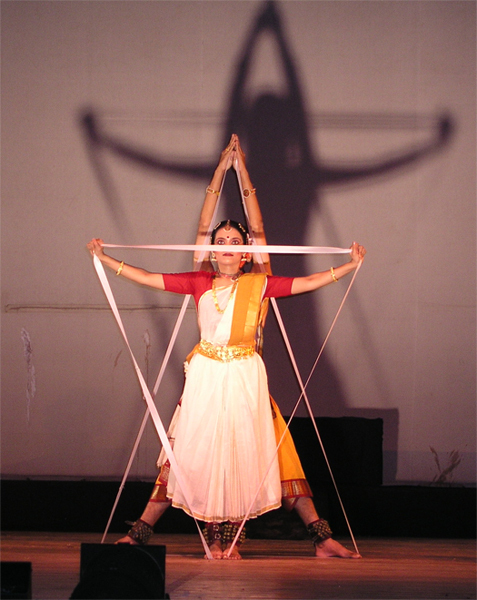 Without the active participation of Prakriti, Purusha stays motionless – ‘vina shakti shiva shavah’. This universal understanding is represented through yogic and tantric manifestation known as Kundalini Yoga. Adi Shankarachrarya celebrates this mystic quality of existence in his poetic work, ‘Saundarya-laheri.’ Paratpar Shiva along with his consort Shakti resides in all the seven Kundalini Chakras. The devotee meditates upon the two opposites of existence, lasya and tandava represented by shakti and shiva respectively. And after visualizing their soulful Universal Dance, the bhakta’s spirit is aroused into the thousand-petalled lotus above the head by passing through all the chakras from below even as he blissfully celebrates the beatitude and auspiciousness of his existence. The Supreme Consciousness of the finest of human psyche has been presented in the most refined manner in the classical dance format by the students of Rasadhwani.